Choose your own content. Tweak your own design. BuildingLink gives you the option to choose from more than two dozen different widgets including Event Log and Packages, Scrolling Announcements, Building Calendar, Amenity Reservations, Announcements, Local Events, Weather Forecasts and more. Choose from eight different styles of Clock faces, or make a "green" statement by dropping in a local Transit widget showing train or bus schedules for the station nearest you (currently available in 6 regions). Take a few more seconds to perfect your Flex display by choosing a background color and design that matches the décor of your building. You can change the design as often as you like for a refreshed look your residents will enjoy. You can also configure as many different Flex displays as you wish, showing different content for different areas of your property as relevant. Use your imagination! Keep your staff sane and your residents well-informed by placing a public display in the lobby, mail room, fitness center or entranceways. Unless there’s an electricity outage, you’ll never get a question about announcements and events, package deliveries, amenity reservations, the weather or even what time it is, ever again. Contact our support team to have us “turn on” your Flex mode display option today. Email support@buildinglink.com or call 1 (877) 501 7117. 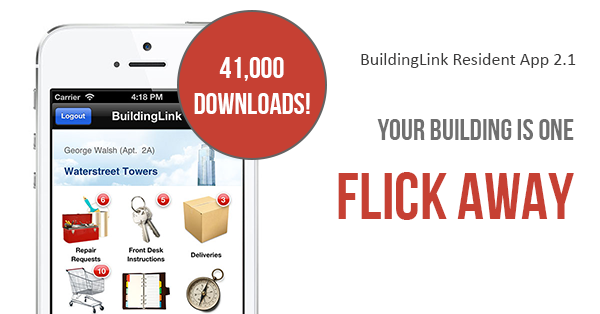 Our recently released Version 2.1 update to our tremendously popular and free BuildingLink Resident App has already been downloaded by over 41,000 residents. Designed for both iPhone and iPad, our updated app is now equipped with a Car Valet module and also gives residents access to all the building forms and documents posted to the website, right from the palm of their hand. The Resident App version 2.1 is available to download from the App Store.